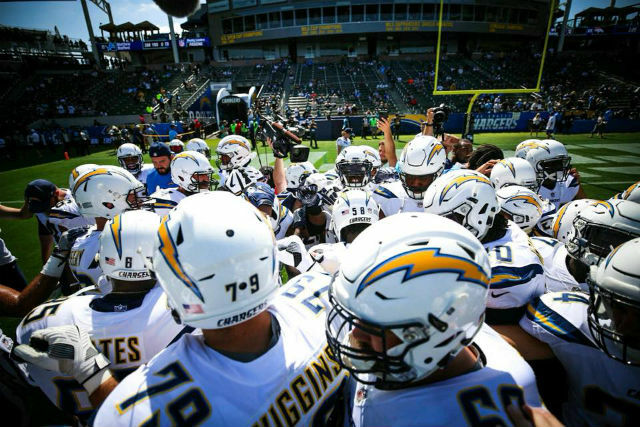 The Los Angeles Chargers will open the 2018 regular season by playing host to the Kansas City Chiefs on Sept. 9 at StubHub Center, the NFL announced Thursday. The Chargers were 0-2 against the Chiefs in 2017, losing 24-10 Sept. 24 at StubHub Center and 30-13 Dec. 16 at Kansas City. The Dec. 13 game against Kansas City will be played on a Thursday and be televised by Fox and the NFL Network in the Chargers lone prime-time game. The Chargers will travel approximately 30,000 miles during the 2018 regular season, a team official said. “We’ve been wanting to get back on the field since the day after the Oakland game,” coach Anthony Lynn said referring the Dec. 31, 2017 regular- season finale. “Missing out on that playoff tiebreaker left a sour taste in everyone’s mouth, so schedule release day is pretty nice in that it helps us lock in on the job at hand for 2018.